OZONE Pollution Technology has launched a new range of mobile work benches with integral dust and fume extraction capabilities. These ergonomically designed bench cleaners maintain productivity while providing a clean, healthy work environment. The downdraft bench cleaner is suitable for controlling dust and fume generated by a handheld tool. Grinding, sanding, polishing, de-burring, welding or oxy-cutting are examples. Equally suitable for metal, fibreglass, plastics or wood. The 3mm solid worktop overhangs the filter chamber, providing a comfortable work position. By extending the telescopic handles, the cleaner can be tilted onto its two castors and wheeled around the workshop. The control panel features an electric socket allowing the operator to run a powertool from the cleaners own power supply. 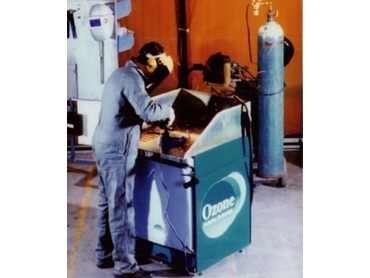 At the heart of the bench cleaner is the patented Ozone Channel Cartridge. A four stage filtration process provides long filter life and high efficiencies. Peak performance is maintained by an in-built vibro filter cleaning system. Dust is collected in a 40 litre slide out drawer.